Electric Motorcycles & Scooters Market size is estimated to surpass USD 22 billion by 2024; according to a new research report by Global Market Insights, Inc.
Low noise levels, high mechanical efficiency, easy incorporation of regenerative braking, and relatively economical maintenance costs are among the chief benefits over the conventional internal combustion engines (ICE) which will propel the electric motorcycles & scooters market growth over the forecast timeframe. Favorable regulatory standards and incentive plans imposed by the regional authorities will also fuel the electric motorcycles & scooters market growth over the forecast period. For instance, in 2010, Province of Ontario realized the Green Plate and Electric Vehicle (EV) rebate program that offered the owners with significant cost savings on maintenance, fuels, and access to high-occupancy vehicle (HOV) lanes. Such programs are expected to boost the users’ motivation towards the adoption of electric motorcycles & scooters and aid in enhancing the global recognition of the role of these vehicles in reduction of greenhouse gases and harmful pollutants emissions across the globe. 48V battery dominates the electric motorcycles & scooters market, accounting for over 35% volume share in 2017. Superior power output along with ease in compatibility of these batteries with e-vehicles will drive the segment growth. Vehicles equipped with 60V & 70V will witness strong growth over the forecast timeframe owing to constant R&D in enhancing the speed of the vehicle. 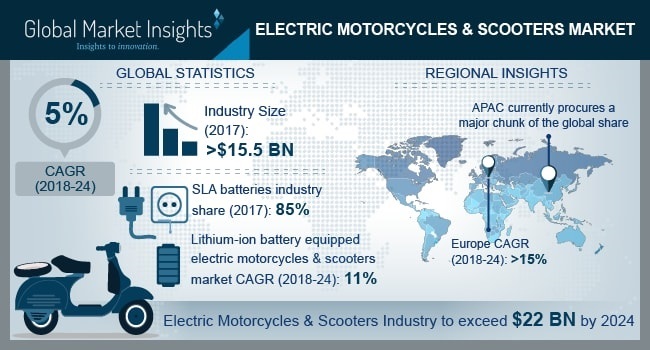 Asia Pacific dominates the overall electric motorcycles & scooters market share owing to strong presence of industry player in China, India, Japan & Indonesia. Traffic congestion, rising population, concern regarding environment and low price of these vehicles compared to conventional vehicles have resulted in strong consumer preference. Acquisition and product development are expected to remain the key strategies of the industry participants. For instance, in January 2015, Polaris acquired Brammo’s electric motorcycle business to enter the electric motorcycles & scooters market. It has acted as a leading investor for the recapitalization of Brammo, which will further focus towards development, design, and integration of electric vehicle powertrain.